Hotel at Kochi, Ernakulam, Kerala, India. Abad Airport Hotel is situated at Nedumbassery, Opposite to Cochin International Airport, 29 Kms from Cochin city and 40 kms from Trissur. 56 centrally air-conditioned,spacious, well furnished rooms and suites, with sound proof windows and doors. ABAD group runs a chain of 11 Resorts and Hotels in Kerala India asserting its presence in Kerala's Tourism and Hospitality Scenario. 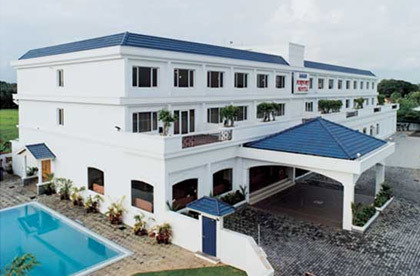 Six hotels are located in Cochin ( Ernakulam) including one at Cochin International Airport and the Resorts are located at Munnar, Kumarakom, Thekkady, Marari Beach and Kovalam. Guests can take advantage of our facilities and distinctive services which include: Fitness Center, Swimming pool, Business center, travel desk, concierge, currency exchange & laundry. Banqueting & conference facilities to cater upto 200 persons. View a list of our complete facilities below. Abad Airport Hotel is having 56 centrally air-conditioned, spacious, well furnished rooms, and suites, with soundproof windows and doors. Attached bathrooms with 24 hour running hot and cold water. Television with satellite channels. Refrigerators in all rooms.